A few years ago I accidentally gave up coffee. It wasn’t pleasant at the time, but I felt much better afterwards, so I stuck with it. I still enjoy a very occasional double espresso, and caffeine is a wonderful thing when it’s not part of a regular habit or dependency. 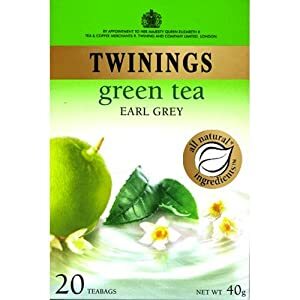 When I returned from the holiday that led to me giving up coffee Twinings had just launched their new range of Green Teas, and frequently gave away samples at London Bridge and Canary Wharf stations – so some mornings I got two samples. I quickly discovered that a cup of green tea made for a good start for the day. The pineapple and grapefruit mix was an early favourite, but then I discovered the Green and Earl Grey and I had a new daily cuppa. Initially I had no problem getting this blend, as the launch promotion reached into most major supermarkets and I could pick it up off the shelf. Then I found myself having to make a special trip to the big Tesco in the next town, and then I found myself having to order direct from the Twinings online store. I used to order a lot in one go (normally the best part of a years supply) in order to get free shipping. To my horror I discovered earlier this year that Twinings had discontinued the line (not long after I’d made my last order). I wish they’d emailed to say so in advance – I’d have probably bought a huge stockpile – tea doesn’t seem to go off. Green on its own is too boring. A bit of green and a bit of Earl Grey in the same cup comes out with too much black tea flavour. I even tried flavouring some green tea bags with Bergamot oil following some instructions I found on Reddit, but it came out with too much of a bitter after taste. and then I found my salvation. Taylors of Harrogate (the tea brand that goes with the famous Betty’s tea rooms that was a fixture of my University days in York) has a Green Earl Grey blend. It’s a bit more floral than the Twinings, and I suspect it’s a bit more sensitive to water temperature (add some cold first to avoid bitter after taste), but after about a month I’m happily switched over. Fingers crossed that they’re still doing it when I finish the 350 bags I got in my first order.